Percy Alsop was the eldest son of twelve children, four sons and eight daughters, the family of Henry Alsop, a clerk with the Midland Railway and Mary Elizabeth (née Griffith), his wife. who lived at 2 Broadgate Beeston2. He was born in 1891 in Mansfield Woodhouse, Notts2, moving to Beeston in about 1896, as a young boy, with his parents. He attended the Nether Street School gaining three silver and bronze medals for good attendances, at one stage losing not a single day in three and a half years. He was also a keen member of Mr. E. C. Farrow’s Bible Class. After leaving school he worked in the clerical department at the Humber works, going with that company when it was transferred to Coventry in 1908. On returning to Beeston he working as a clerk for a lace merchant and then replaced his brother in the Cost Office at the Ericssons Telephone Works. After enlisting in the forces he was posted to the Transport Section of the Sherwood Foresters but was later invalided home and discharged. Later, on 10 December 1915, he enlisted, presumably under the Derby Scheme, but later attended a deferment tribunal in Beeston when he appealed on medical and business grounds. He had only left a sanatorium some months previous and as soon has he was able to work had bought a dairyman's business. His application for deferral was unsuccessful and he was mobilised on 16th February 1916 with the 3rd Battalion Sherwood Foresters4. He was sent out in a draft to France in May 1916 where he was wounded on 8th July 1916. After repatriation and treatment, he was sent out again to France on 31 December 1916 with 15 Battalion, Sherwood Foresters. Approval was given early in August 1917, for a major undertaking involving a raid on Guillemont Farm and the capture of a commanding position known as 'The Knoll'. Instruction was given to the battalion as part of the 105th Brigade who were given this task and after extensive artillery fire the 15th Battalion advanced at 0400 hrs on the 19th August. 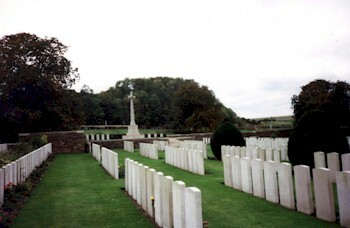 When the barrage lifted and the battalion reached the enemy position they found the artillery had done their job, hand-to-hand fighting continued until the Germans were driven back, the assault being over in some fifteen minutes and by 0540 hrs the companies returned with their wounded and a few prisoners. Tragically, three of the wounded were at the hands of the Royal Flying Corps who machined gunned them down unaware they were firing at their own5. During this action and enemy shellfire, Private Alsop had stuck to his post with a Lewis gun team but was killed instantaneously during a further raid near Guillemont Farm. He is buried in the Templeux-Le-Guerard British Cemetery which is south-east of the village of Templeux-Le-Guerard, on the road to Haricourt. 2Beeston, 1911 Census, Piece 20430 RD429 SD3 ED5 Schedule 292. The family were than living at 2 Broadgate, Beeston. The two oldest daughters (Mary Maud, age 25 and Florence Emma. age 24) were both working as clerks for the Great Northern Railway. Percy Douglas (19) was working as a lace merchant's clerk. James Edward (17) was working as an engineer's cost clerk, Maggie Georgina (16) remained at home. Doris May (14) was apprenticed to a dressmaker. Edna Madelon (12) and Noel Guy (10) were attending school. Nina Irene (4) and Henry Kenneth (3) were at home. There had been 12 children born to the parents; two having died in infancy. 3He was baptised at Mansfield Woodhouse on 20th September, 1891. 4His surviving Army Service Records date only from his Attestation at Beeston on 10 December 1915 when no mention was made of any earlier service. There is a record there of his two postings to France and his gun shot wound in July 1916 but no record of the circumstances of his death. It is likely that the account of his death was contained in a letter to his parents from his Commanding Officer. 6Based on his surviving Army Service Record. He was described as a 'Dairyman' when he attested.